Rohingya are an Islamic ethnic group settled in particular in Myanmar (Burma). Given that they were heavily discriminated, tens of thousands preferred to seek refuge in other countries of the area, but they have been welcomed with difficulty, if not rejected. 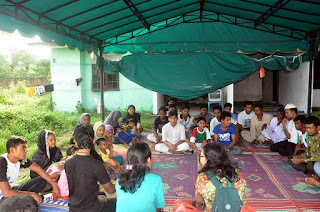 The Community of Sant'Egidio of Medan, in western Indonesia, has recently started to visit a refugee camp near the city.